Download "CLASS SPECIFICATION DIRECTOR OF HUMAN RESOURCES/LABOR RELATIONS"
1 CLASS SPECIFICATION Class Code: Date Est: 10/2011 Last Rev: Last Title Chg: FLSA: Exempt DIRECTOR OF HUMAN RESOURCES/LABOR RELATIONS DEFINITION Under administrative direction, plans, directs and implements the programs and policies of a comprehensive human resources department; supervises professional and support staff in the areas of employee benefits, labor relations, recruitment, selection, classification, compensation, policy development, workforce development, pay administration, records maintenance, EEO; and performs related work as required. EXPERIENCE AND TRAINING REQUIREMENTS A Bachelor's degree from an accredited college or university in Public Administration, Business Administration, or a closely related field, and eight years of progressively responsible human resources experience including labor relations experience as a chief negotiator, and three years of experience in a management or supervisory capacity; OR an equivalent combination of education and experience. LICENSE OR CERTIFICATE A valid driver s license is required at the time of appointment. SUPERVISION EXERCISED This is a management position, exercising direct and indirect supervision over departmental staff. EXAMPLES OF DUTIES (The following is used as a partial description and is not restrictive as to duties required.) Develop Human Resources related programs, policies, and procedures for the County that is in keeping with Federal, State, and EEOC guidelines and good business practices. Provide administrative direction for employee health benefit programs including medical, dental, vision, retiree medical plans, wellness, and employee assistance programs. Provide direct oversight for the County's compensation plan, deferred compensation plans, labor relations programs, and other employee programs in support of the County s Mission. Serve as the Public Employees Retirement System (PERS) Liaison Officer. 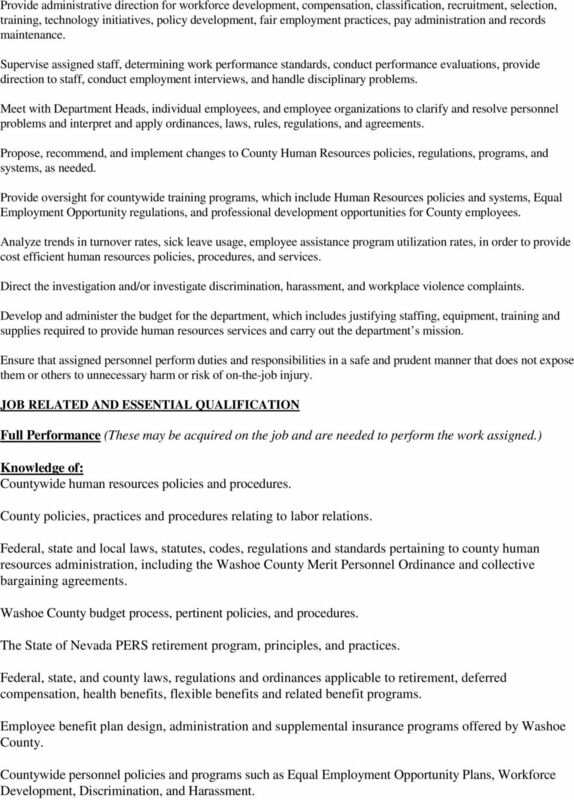 Coordinate retirement matters between PERS, Washoe County and Washoe County Employees; includes audits, disability retirement, rate adjustments, and information requests. Plan and administer the labor relations program, which includes serving as the chief negotiator for the County, planning negotiation strategies, providing input to and seeking guidelines from management and the Board of County Commissioners relating to the cost and impact of contract proposals and representing the County at mediation, fact finding and arbitration hearings. Manage and coordinate the County s labor relations program which includes contract administration, dispute resolution, discipline, and grievance reviews. 2 Provide administrative direction for workforce development, compensation, classification, recruitment, selection, training, technology initiatives, policy development, fair employment practices, pay administration and records maintenance. Supervise assigned staff, determining work performance standards, conduct performance evaluations, provide direction to staff, conduct employment interviews, and handle disciplinary problems. Meet with Department Heads, individual employees, and employee organizations to clarify and resolve personnel problems and interpret and apply ordinances, laws, rules, regulations, and agreements. Propose, recommend, and implement changes to County Human Resources policies, regulations, programs, and systems, as needed. Provide oversight for countywide training programs, which include Human Resources policies and systems, Equal Employment Opportunity regulations, and professional development opportunities for County employees. Analyze trends in turnover rates, sick leave usage, employee assistance program utilization rates, in order to provide cost efficient human resources policies, procedures, and services. Direct the investigation and/or investigate discrimination, harassment, and workplace violence complaints. Develop and administer the budget for the department, which includes justifying staffing, equipment, training and supplies required to provide human resources services and carry out the department s mission. Ensure that assigned personnel perform duties and responsibilities in a safe and prudent manner that does not expose them or others to unnecessary harm or risk of on-the-job injury. JOB RELATED AND ESSENTIAL QUALIFICATION Full Performance (These may be acquired on the job and are needed to perform the work assigned.) 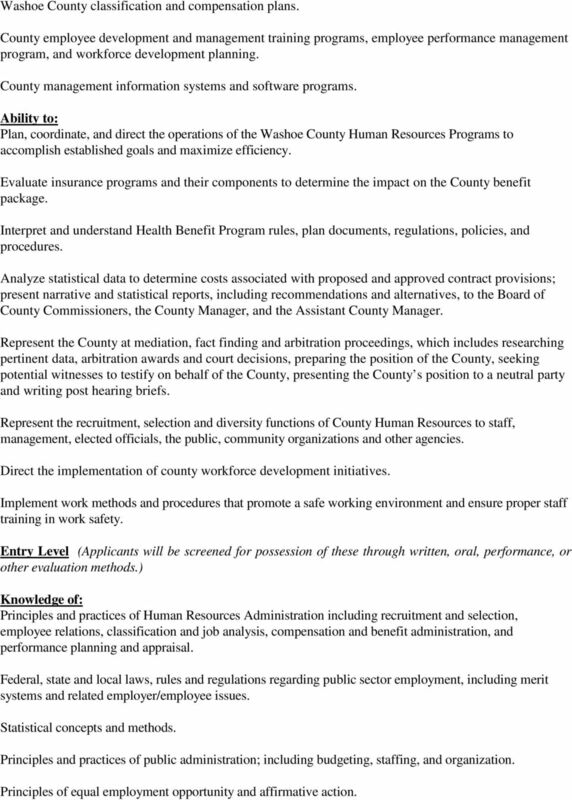 Knowledge of: Countywide human resources policies and procedures. County policies, practices and procedures relating to labor relations. Federal, state and local laws, statutes, codes, regulations and standards pertaining to county human resources administration, including the Washoe County Merit Personnel Ordinance and collective bargaining agreements. Washoe County budget process, pertinent policies, and procedures. The State of Nevada PERS retirement program, principles, and practices. Federal, state, and county laws, regulations and ordinances applicable to retirement, deferred compensation, health benefits, flexible benefits and related benefit programs. Employee benefit plan design, administration and supplemental insurance programs offered by Washoe County. Countywide personnel policies and programs such as Equal Employment Opportunity Plans, Workforce Development, Discrimination, and Harassment. 3 Washoe County classification and compensation plans. County employee development and management training programs, employee performance management program, and workforce development planning. County management information systems and software programs. 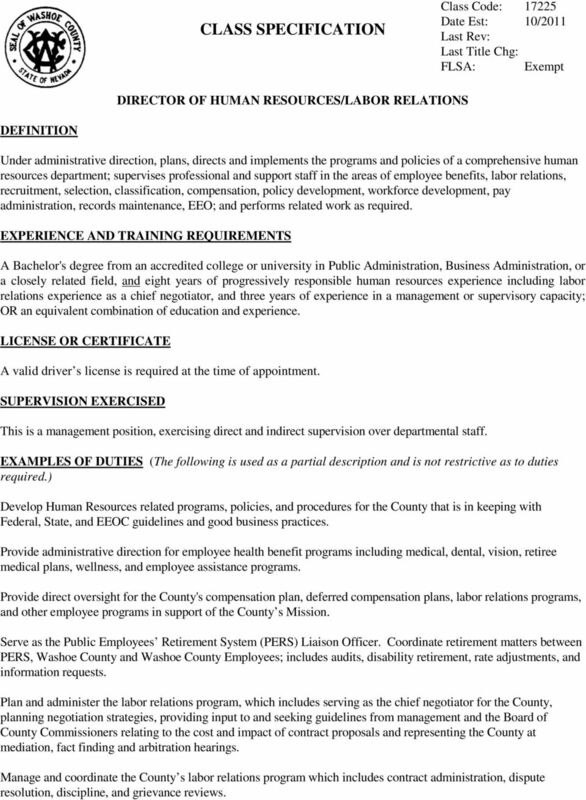 Ability to: Plan, coordinate, and direct the operations of the Washoe County Human Resources Programs to accomplish established goals and maximize efficiency. Evaluate insurance programs and their components to determine the impact on the County benefit package. Interpret and understand Health Benefit Program rules, plan documents, regulations, policies, and procedures. Analyze statistical data to determine costs associated with proposed and approved contract provisions; present narrative and statistical reports, including recommendations and alternatives, to the Board of County Commissioners, the County Manager, and the Assistant County Manager. Represent the County at mediation, fact finding and arbitration proceedings, which includes researching pertinent data, arbitration awards and court decisions, preparing the position of the County, seeking potential witnesses to testify on behalf of the County, presenting the County s position to a neutral party and writing post hearing briefs. Represent the recruitment, selection and diversity functions of County Human Resources to staff, management, elected officials, the public, community organizations and other agencies. Direct the implementation of county workforce development initiatives. Implement work methods and procedures that promote a safe working environment and ensure proper staff training in work safety. Entry Level (Applicants will be screened for possession of these through written, oral, performance, or other evaluation methods.) Knowledge of: Principles and practices of Human Resources Administration including recruitment and selection, employee relations, classification and job analysis, compensation and benefit administration, and performance planning and appraisal. Federal, state and local laws, rules and regulations regarding public sector employment, including merit systems and related employer/employee issues. Statistical concepts and methods. Principles and practices of public administration; including budgeting, staffing, and organization. Principles of equal employment opportunity and affirmative action. 4 Employee training and management development concepts. Principles and practices of program planning, implementation, and administration. Principles and practices of management and supervision. Comprehensive employee benefits programs, including plans such as retirement, health, life, dental, vision, deferred compensation, and employee assistance. Principles, practices, and techniques of collective bargaining, due process, labor, and employee relations. Administrative Board and Court decisions relating to labor relations. Applicable laws, regulations, and decisions pertaining to collective bargaining, public personnel administration and due process. Mediation, fact finding, and arbitration procedures. Dispute resolution techniques. Statistics relating to salary and benefit data. 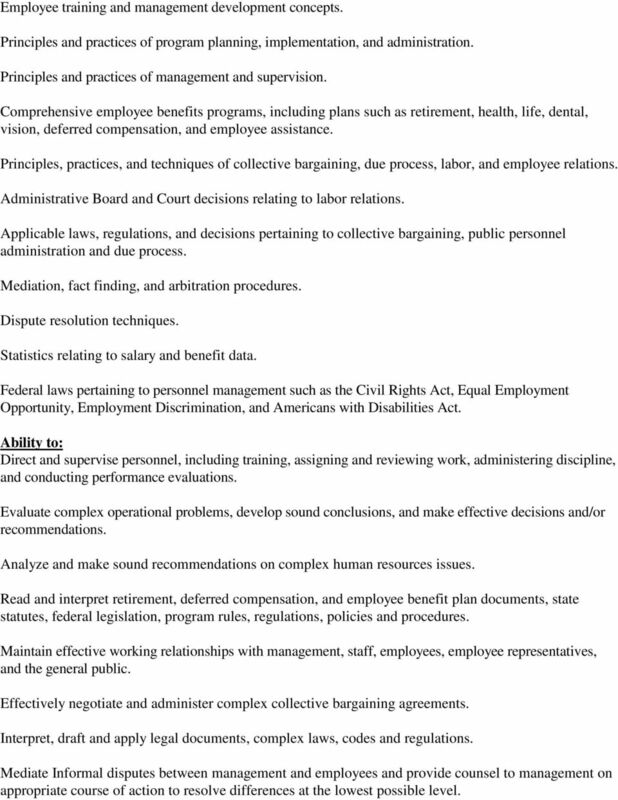 Federal laws pertaining to personnel management such as the Civil Rights Act, Equal Employment Opportunity, Employment Discrimination, and Americans with Disabilities Act. Ability to: Direct and supervise personnel, including training, assigning and reviewing work, administering discipline, and conducting performance evaluations. Evaluate complex operational problems, develop sound conclusions, and make effective decisions and/or recommendations. Analyze and make sound recommendations on complex human resources issues. Read and interpret retirement, deferred compensation, and employee benefit plan documents, state statutes, federal legislation, program rules, regulations, policies and procedures. Maintain effective working relationships with management, staff, employees, employee representatives, and the general public. Effectively negotiate and administer complex collective bargaining agreements. Interpret, draft and apply legal documents, complex laws, codes and regulations. Mediate Informal disputes between management and employees and provide counsel to management on appropriate course of action to resolve differences at the lowest possible level. 5 Communicate effectively with customers, clients, and the public in writing and in face-to-face one on one settings and in group settings in order to gain concurrence and cooperation through discussion and persuasion. Equitably apply principles and practices of personnel administration. Read, learn, interpret, apply and explain pertinent laws, statutes, EEO court decisions, legislation, codes, regulations and standards. Computer Applications related to human resources including word processing, spreadsheets, and database applications. 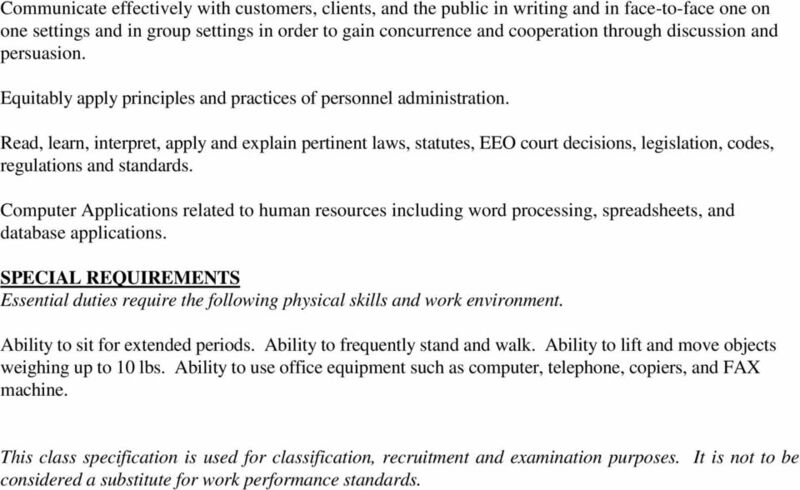 SPECIAL REQUIREMENTS Essential duties require the following physical skills and work environment. Ability to sit for extended periods. Ability to frequently stand and walk. Ability to lift and move objects weighing up to 10 lbs. Ability to use office equipment such as computer, telephone, copiers, and FAX machine. This class specification is used for classification, recruitment and examination purposes. It is not to be considered a substitute for work performance standards.